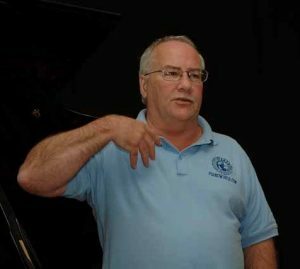 Frank Baxter, the host/Webmaster/owner of Piano World and PianoSupplies.com has been tuning and repairing pianos since 1975. He played in Rock & Roll bands in the 60’s and 70’s and continues to play piano and keyboard for audiences large and small, wherever/whenever the opportunity presents itself. A native of Nahant, MA, (now living in Parsonsfield Maine) he grew up with live music in the house. Frank’s father Charles (Charlie) Baxter was an iron-worker by trade but a piano player at heart. Charlie would play pieces like the 1812 Overture, The Poet & the Peasant, and the Connecticut March on the families old upright piano. Frank’s older (by twelve years) sister also played piano, still does. And she had a huge collection of 45s (45 rpm records for those too young to remember them). For a while in the late 1950s a group of her friends practiced with their rock n’ roll band in Frank’s living room. And then there was Mr. D. Victor J. DalPozzal came to teach music in the Nahant school system when Frank was in 7th grade. Mr. D. as he was known was a breath of fresh air. A man who truly loves music (and a wonderful musician) and wanted to share it with his students. “He opened our eyes and ears to the music of the world and gave us all a good foundation in music that we could build upon. It’s no wonder that many of the students he had went on to work in the music industry, or at the very least, to have a love and appreciation for music”. As of November 2017 Mr. D was still performing and conducting a choir. Frank started in the piano business in 1968 working for an old family music store in Lynn, MA called Curtis Music Store. Originally hired to deliver pianos after school and on Saturdays, he was soon hired to work in the store too. Curtis Music began in 1890 and specialized in exceptional customer service. Apprenticing under Raymond Curtis, a master technician who once built pianos in the Chickering factory, Frank gained invaluable experience in how a craftsman approaches his art. When Raymond retired, Frank continued his education with Raymond’s son-in-law, George Cole, a registered PTG tuner, a Mentor and a friend (now also retired). From there, he went on to start his own piano tuning business, opened his own full line music store (in Newport, RI), played in bands and created All About Pianos! which became (around 1999) Piano World and later added PianoSupplies.com (an online store for piano accessories, tuning equipment, piano moving equipment, music theme party goods and much more). Piano World began as All About Pianos! in January of 1996. Frank began receiving more and more email every day asking for help and making suggestions. This lead him to post more information which brought more people to the site. He still does some of the programming, content, and most of answering the emails, etc. And so Piano World continues to grow, adding new content, revising the design and , as always, answering questions for our valued visitors. How big is Piano World now? Google has indexed over 4 million pages related Piano World. In fact, Piano World received over 6,000,000 unique piano and music loving visitors in 2012 alone! 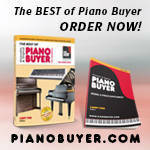 The World Famous Piano Forums have become the most popular section of Piano World. Piano and music-related posts now number over 2-1/2 Million and continue to grow every day. These forums have developed into a wonderful community of 91,000+ people who share a love for the piano. Frank Baxter, Kathleen (Kathy) Ford (Frank’s partner), Barbara Baxter-Wadsworth (Frank’s sister), Larry Wadsworth (brother-in-law), Dr. Indrek Laul (concert pianist and owner of Estonia Piano), Maestro Venno Laul (Indrek’s dad). In Tallinn Estonia at the Laul Estonia Piano Factory with my new piano. The goal of Piano World is to help people locate information about their piano, buy or sell a piano or just have some fun talking about and learning about pianos and music and sharing the joys of playing and listening to pianos. He started taking Flying Lessons before running out of money. Frank recently moved to Parsonsfield Maine with his partner, Kathy Ford. They are looking forward to hosting piano parties . I love music in general, and piano in particular. While I wouldn’t consider myself an accomplished pianist, I do love to play, anytime for anyone.I have friends who are concert pianist (Indrek Laul and Jeffrey Biegel come immediately to mind) and professional jazz pianist (like Rob Mullins), but I have no qualms about playing in front of them (well, maybe a little). I love to share my enthusiasm for all things piano with the world, hence Piano World. One of my greatest pleasures is seeing people organize Piano Parties around the world. What’s a piano party you ask? It’s an event organized to share a common love of the piano. They are often held in people’s homes (we love to host them here in Parsonsfield Maine), but are also held in bigger venues. In 2011 we organized a Piano Tour of European piano makers, starting in Hamburg Germany and ending in Vienna Austria. In 2016 Kathy and I attended a piano party in Milan Italy. 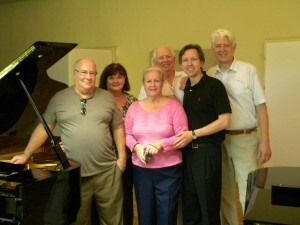 There are a group of our piano forums members from Europe who organize a piano party in a different country each year. So far they’ve held piano parties in Portugal, Belgium, Switzerland (on top of Mount Pilas), Italy, Bulgaria, and Spain. Amazing! And then there are the piano factory tours. 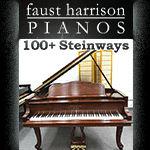 I try to take a group on a tour of the Mason & Hamlin piano factory in Haverhill, MA every year. They put on a great tour. I’ve also organized tours of the Steinway factory in New York, and been lucky enough to tour other piano factories/shops including … Steinway Hamburg Germany, Bosendorfer (Austria), Bluthner (Germany), Steingraeber (Germany), and Estonia (Estonia). And here is an interview I did with Dan Del Fiorentino of NAMM (National Association of Music Merchants) for their oral history program. It’s fun to play the piano … Please Pass It On!